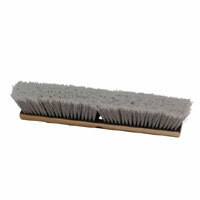 Fine sweeping "SILVER FOX"INDOOR push brooms with 3" soft flagged grey solvent resistantbristles. Bristles are staple set into a lacquered 7/8" thick hardwoodblock with two acme thread holes. Works well on sealed concrete, woodenfloors an..